1Subsequent Windows restarts automatically start the P1TS Server. It's generally recommended to uninstall earlier versions to avoid accidentally running older versions that may not have the latest improvements, bug fixes, and entitlements. Connect this PC to IMSA's pitwall network (i.e., through an IMSA MicroTik, or Nanostation router), so it can access IMSA's ERMon live timing and scoring data stream. When you P1TS Server - Start, it runs as a black background text window whose title also displays the PC's IP address. Ignore the internal messages that scroll by. It appears in the Windows system tray as a P1 icon. You can minimize it, but don't close it. 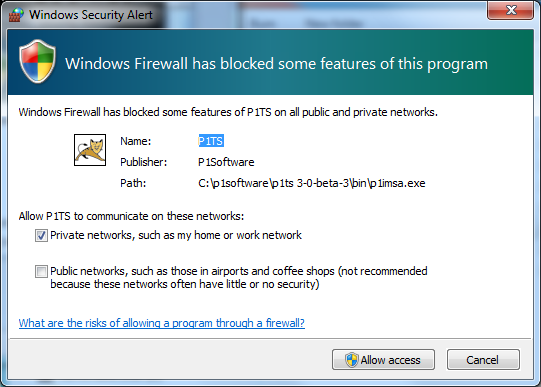 A Windows Firewall dialog appears once, telling you that the P1TS (web) Server wants to allow programs (Chrome) to communicate with it on your network. Press Allow Acccess. To run P1TS in your Chrome browsers, you'll need to enter the IP address of the P1TS Server (step 2) into Chrome's address bar. Start > Run and type cmd /k ipconfig to run ipconfig.exe. 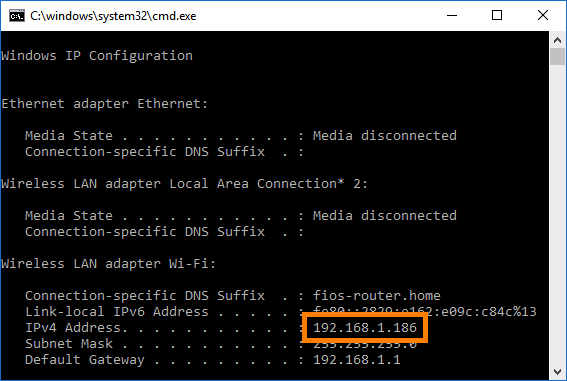 In the resulting cmd window, find the IPv4 Address. Run Chrome on either the PC that is running the P1TS Server (from step 2) or from any other computer, tablet, or smartphone that is on the same network. Enter the P1TS Server PC's IP Address (192.168.1.186 in this example) and the P1TS home page will be loaded from the P1TS Server. Strategist - To split big individual panels on multiple large displays. Strat 1 - For a single screen, finely detailed 1920x1080 display. After you login to P1TS with your supplied credentials, its Welcome dialog steps you through the rest.